It's an interesting question: How does a 40-ton creature move itself along—or move at all for that matter—on a planet such as ours? If the more massive among the dinosaurs were alive today, they'd be like beached whales; they couldn't eat, or take a walk, or even stand up. It seems something has changed, but what? One theory is an increase in Earth's gravity caused by a growing planet. A brief article titled Geological Evidence for the Expanding Earth contends the phenomenon can be explained by an Earth that has increased in size and mass. Many earth scientists have suggested that the Earth has been expanding in size since the time of the dinosaurs. One of the first reasons proposed to explain continental drift (in 1933 by Hilgenberg) was that the Earth had expanded in size causing the continental land mass to split apart. Other earth scientists note that fitting the land and oceans which existed 65 million years ago on an Earth of today's diameter leaves vast spherical gaps in the ocean floor. These gaps can be removed by reducing the size of the ancient Earth. In an August, 2002 release, Christopher Cox, a research scientist at NASA's Goddard Space Flight Center was quoted as saying that "the three areas that can trigger large changes in the Earth's gravitational field are oceans, polar and glacial ice, and atmosphere," although he and a colleague had already ruled out the atmospheric possibility at that point. But it seems there's another answer to the dinosaur paradox, too. I stumbled on it by accident the other day, and it engages the imagination at least as well as the reduced-gravity theory. 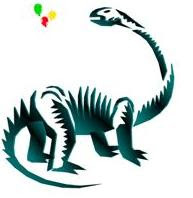 Had our planet's atmosphere been far more liquid than it is today, goes theory #2, the sauropods would have been buoyant; they would have been happily leaping about, instead of lumbering through life, dragging their great tails behind them. In fact, David Esker likes the idea very much, and, rumor has it, is on the verge of publishing a book on the subject. Either way—lack of gravity or thick, watery atmosphere—I love the idea of those gargantuan beasts floating merrily along like lumpy blimps . . . wait . . . stop the music. I just had an idea of my own, and I'm beginning to like it even more than the other two. Helium! The dinosaurs were filled with helium! No, it could happen. There's evidence to suggest a very different atmospheric composition in those days—far less oxygen, among other things—and who's to say the dinos' lungs weren't perfect for the job? I mean, have you ever seen a petrified dinosaur lung? Neither have I. They don't exist, and it's because they all escaped, millions of years ago, through the dinosaurs' nostrils and floated up into space and went into orbit around Saturn. Forget Cassini. I think those rings are made of stranger stuff.